Cavalier King Charles Spaniels descended from spaniel roots and were first bred by crossing small spaniels with East Asian toy breeds. They were often referred to as “comforter spaniels”, as they functioned as foot and lap warmers and helped to drive away fleas from the bodies of their owners. King Charles II’s fascination with his toy spaniels led to the dogs being called King Charles Spaniels. After he died, the Duke of Marlborough became the promoter of the breed. For many generations, wealthy households have kept Cavalier King Charles Spaniels as pets, but in recent decades, the breed has become a popular choice for all types of families. Due to their unique combination of spaniel and toy traits, Cavalier King Charles Spaniels are often referred to as a “sporting toy breed”. They typically have an affectionate temperament and are playful and quite gentle. Cavalier King Charles Spaniels love cuddling on their owner’s lap and curling up in soft blankets. In addition to their loving traits, the breed has significant athletic instincts. They love to run and chase toys and other animals, so a fenced yard or a leash are vital for time spent outdoors. The breed has a moderate bone structure and a relatively long body. Cavalier King Charles Spaniels have the build of a working Spaniel, only slightly smaller. They typically live between 9 and 14 years of age and can suffer from a variety of different canine health problems. If you’re considering adopting a Cavalier King Charles Spaniel, get to know their most common health problems and issues to see if it will be a good fit. Heart Mitral Valve Disease is a terminal illness that affects over half of all Cavalier King Charles Spaniels by 5 years of age and almost all of the breed by 10 years of age. MVD is the leading cause of death for the breed and prevents the heart’s mitral valve from closing after blood flows from the atrium to the ventricle. This creates excess blood to flow to the atrium which leads to strain on the atrium making it much less efficient at pumping blood. MVD will eventually cause a Cavalier King Charles Spaniel’s heart to murmur. Symptoms include lethargy and unwillingness to exercise, shortness of breath, sleeplessness, and suppressed appetite. There is currently no cure for Mitral Valve Heart Disease, but certain medications are available for alleviating some of the symptoms. This condition affects almost a quarter of the Cavalier King Charles Spaniel breed. Hip dysplasia in dogs is a genetic disease that causes dogs significant pain, abnormal development, and debilitation. Dogs that suffer from the condition experience severe discomfort and may be subject to canine arthritis. Symptoms of hip dysplasia are usually clear and can include uneven leg movement or walking and standing with one leg raised. However, the only way to accurately diagnose the condition is through an X-Ray. Treatment for hip dysplasia usually includes medication to reduce pain. In some severe cases, surgery may be performed in order to replace the hip. Syringomyelia is a very common disease for Cavalier King Charles Spaniels. The disorder affects the brain and spinal cord, causing severe head and neck pain, and in some cases, dog paralysis. SM can be very serious when a dog’s spinal cord cavities near the brain become filled with fluid. The Cavalier King Charles Spaniel breed has a relatively small skull which can’t always support their brain’s cerebellum. This can lead to obstruction to the flow of cerebrospinal fluid into their spinal cord. The result is a buildup of fluid in the skull’s cavities. Symptoms of Syringomyelia may not appear until a Cavalier King Charles Spaniel is between 6 months to a year old. Because of this, the condition can’t be identified when a new puppy is adopted. Typical symptoms include scratching the back of the neck, sensitivity to touch on the neck, and severe pain that causes whimpering and yelping. SM can be diagnosed only through an MRI, but treatment is limited. Steroid medications may be used to reduce symptoms, but unfortunately, there is no cure for the disease. Although the low blood platelet counts are common for the breed, they are not typically a major health problem in Cavalier King Charles Spaniels. If a dog is diagnosed with a low blood platelet, it may be a sign of a more serious condition such as anemia. Similar to humans, canine obesity can be a dangerous condition in dogs. An obese Cavalier King Charles Spaniel is at a higher risk for several health problems. The primary risk for dogs with obesity is heart issues. Cavalier King Charles Spaniels will also experience additional strain on their joints and limbs. The strain can have a negative impact on the heart since it will increase its workload for pumping blood around the body. Additionally, excess fat on a dog’s body can add pressure on internal organs and decrease blood circulation to the lungs. Symptoms of obesity in Cavalier King Charles Spaniels will be obvious to most owners and will appear in the form of excess weight on a dog. All breeds require some amount of exercise in order to maintain a healthy weight. The unnecessary strain on their joints and bones can cause a Cavalier King Charles Spaniel to become lethargic and exhibit low energy levels. Treatment includes adequate exercise and a monitored diet. Close to 30% of the Cavalier King Charles Spaniels breed will suffer from eye problems. They are subject to a variety of different eye conditions including keratoconjunctivitis, keratitis sicca, cataracts, corneal dystrophy, distichiasis, entropion, progressive retinal atrophy, retinal dysplasia, and microphthalmia. Keratoconjunctivitis and keratitis sicca are the most common and arise from an autoimmune reaction of a dog’s tear gland. This reduces the production of tears and leads to a dry and inflamed cornea. The dryness will cause severe discomfort in dogs including a persistent burning sensation. If the problem persists, it may result in a scarred cornea which can ultimately lead to canine blindness. Symptoms include redness of the eye, discharge, or film over the eye. Treatment should be administered as soon as possible and can come in the form of a topical antibiotic or anti-inflammatory medication. If properly treated, the condition can decrease and potentially heal over time. Cavalier King Charles Spaniels are also at risk for certain ear disorders including primary secretory otitis media (PSOM). The condition is sometimes referred to as “glue ear” as it can result in a severe mucus plug that fills a dog’s middle ear and sometimes causes the tympanic membrane to bulge. PSOM appears mostly in Cavaliers, affecting close to half the breed. The ear disorder causes pain and other sensations to the back of a dog’s head and neck and appears in symptoms similar to those of Syringomyelia. In addition to PSOM, Cavalier King Charles Spaniels are predisposed to a form of congenital deafness. The condition is present at birth and is the result of a lack of formation of receptors in the inner ear. This can lead to progressive hearing loss and may cause a dog to go completely deaf between the ages of 3 and 5. Diseases and other health conditions can be painful and uncomfortable for pets and expensive and time-consuming for their owners. Although predisposed conditions in Cavalier King Charles Spaniels cannot be prevented, there are certain steps owners can take to reduce the risk of other health problems. Cavalier King Charles Spaniels are not particularly suited for the outdoors and should be kept inside most of the time. They get along with children and other dogs and are generally quiet pets. They enjoy spending time cuddling up indoors for most of the day, which is harmless for the breed as long as they get a daily walk. The breed requires a moderate amount of regular exercise, which can be achieved in a secure outdoor area or on a leash. Proper exercise will prevent lethargy and obesity. Cavaliers love to romp around and chase animals and other moving objects. They get along well with children and other dogs and can be a bit quiet. Cavaliers do equally well with active types and homebodies—they can be loyal hiking partners or shameless couch potatoes, depending on the owner’s personality—as long as they get a satisfying walk each day. It’s best to feed a dog a formula that is designed with their size and age in mind as well as the breed’s unique digestive needs. Many brands of dog food offer breed-specific formulas that are specified for different sizes of canines. Cavalier King Charles Spaniels are a small breed, so this will need to be taken into account when selecting the type of food you feed them. It may be a good idea to work with a breeder or your veterinarian in order to determine how often they are fed as well as the best diet for their age. Fresh water should also be available for your pet at all times. Cavalier King Charles Spaniels have a long coat that requires frequent brushing. Many owners choose to use a comb or a soft brush to keep their Cavalier’s coat in good shape. Regular dog baths will also keep their hair free of matting and tangles. Additionally, you’ll want to trim your dog’s nails on a regular basis in order to prevent cracking and overgrowth. To prevent gum disease, it’s important to also brush your dog’s teeth regularly. Lastly, the long ears of a Cavalier King Charles Spaniel should be checked on a regular basis for wax and debris. A buildup in their ears can lead to an infection. The Cavalier King Charles Spaniel breed is very dependent on the companionship of their human owners. They prefer to be around people for most of the day and may become stressed if they are left alone for too long. The breed is known to have a pattern of separation anxiety. Spending quality time with them on a daily basis will prevent this as well as excess barking or destructive chewing. 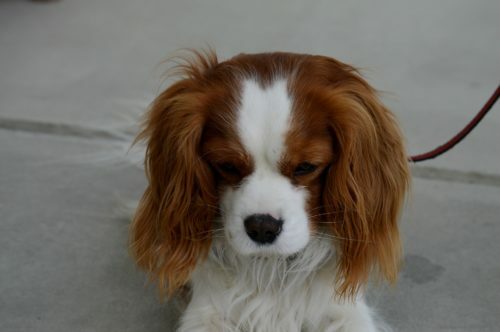 Stay aware of the symptoms of the most common health problems of Cavalier King Charles Spaniels. If you notice lethargy, suppressed appetite, or other changes in their behavior, it’s a good idea to consult a professional. Additionally, clouding or redness of their eyes, excess scratching, dry skin, limping, and abnormal shedding may be a sign of a serious disorder in your pet. Keep your vet in the loop about any sudden changes in your Cavalier King Charles Spaniel’s appearance or demeanor. Dog grooming sessions are a good time to detect lumps, skin rashes, or other symptoms. Heart murmurs detected by your veterinarian would require more tests to rule out other potentially serious conditions. Responsible pet owners must accept that their furry companions are not invincible. Most dogs will face some sort of health concern during their lifespan. The best thing owners can do is take the necessary steps to keep their dog healthy and be prepared for any health conditions in the future. “Cavalier King Charles Spaniel.” PetMD, Accessed 17 Jan. 2018. www.petmd.com/dog/breeds/c_dg_cavalier_king_charles_spaniel. “Cavalier Health.” CavalierHealth.org , Accessed 17 Jan. 2018. www.cavalierhealth.org/. Alt, Kimberly. “Cavalier King Charles Spaniel Health Problems.” CanineJournal.com, 20 July 2018, Accessed 17 Jan. 2018. www.caninejournal.com/cavalier-king-charles-spaniel-health-problems/. “Top 3 Health Concerns For Your King Charles Spaniel.” IHeartDogs.com, 2 May 2017, Accessed 17 Jan. 2018. www.iheartdogs.com/top-3-health-concerns-for-your-king-charles-spaniel/. “Health Information for Cavalier King Charles Spaniel.” The Kennel Club, Accessed 17 Jan. 2018. www.thekennelclub.org.uk/services/public/breed/health.aspx?id=6149.